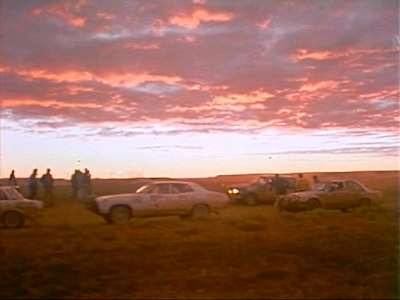 The night of trialling back across the Flinders Ranges and then north-west to the opal mining town of Coober Pedy was deceptively challenging despite that fact that most of the leadings crews lost little or no time. A number of the leaders had “scares” and one top runner, seventh placed Larry Perkins in the VW Beetle, would crash and retire. There was also the midnight challenge of an erroneous distance on the Marree transport that caught out some of the leading crews. The sun was setting on Tuesday evening as the first crews headed out of Broken Hill at 6.00 pm. The road order into and out of Broken Hill was something like this: Brock, Portman, Bond, Ferguson, Carr, Johnson, Perkins (? ), Mehta, Sutton (? ), Rowney, Dunkerton, Stewart, Cowan, Nalder, Mason, Fury, Warmbold, Jensen, Hodgson, Herrmann, Barth, Hilton, Loader. The run up the Silver City Highway to Stephens Creek was uneventful for all of the leaders. Further down the field various cars were requiring major repairs in Broken Hill and would lose time on the ensuing transport as a result. Gelignite Jack Murray lost 40 minutes, the Colless Datsun 1600 and Taylor's Rover both lost over an hour while the Mitchell Cortina lost over 2 hours. Beyond those losses, crews were out of late running time which was 3 hours to Broken Hill and a total of 5 hours to Kingoonya, so many were cutting and running to Kingoonya or to Nullarbor the next afternoon or evening. The run back across the SA border to Frome Downs had a mixture of terrain and road conditions but was always going to be cleanable by many competitors. It started with 54 km of reasonable gravel up to Corona, although some of the creek crossings were a bit severe at high speed. Some reasonable dirt roads then took crews past Kantappa Homestead then to Mulga Valley where there was a new track around the homestead together with a passage control. The Brock Commodore ignored the makeshift arrows and followed the original route instructions, missing the passage, but were not penalised, not only because the officials had seen them, but because the detour was not really enforceable anyway. The route continued on sandy station tracks down to Mulyungarie station after which it was a reasonably fast run across the undulating sand based road to Frome Downs Homestead. About half way to Frome Downs competitors made their first crossing of the Dog Fence, with the gate definitely to be shut at all times (the other three crossings were just west of Marree, just east of Coober Pedy and near Wynbring on the approach to the Nullarbor). Many cars were quite early, including almost all of the leading pack. Dunkerton had a problem, reportedly two broken shockers and a loose alternator, and lost 11 minutes and quite a few places on the road. Jensen lost 8, McCubbin 29, Maloney 7 and Mizel a massive 40 minutes. Gelignite Jack dropped 16, perhaps hindered by the dust of slower cars further down the running order, as well as deteriorating road conditions. The Goldsborough Commodore struck problems dropping 45 minutes. The Mitchell Cortina continued to have problems dropping over 2 hours and would have been perilously close to their late time limit. About 90 cars completed the stage and about 40 cars cleaned as follows: Portman, Brock, Bond, Ferguson, Carr, Johnson, Mehta, Perkins, Rowney, Cowan, Stewart, Nalder, Fury, Warmbold, Mason, Barth, Herrmann, Hilton, Loader, Davis, Hurrey, Watson, Quill, Jackson, Colless, Faulkner, Roberts, Mietuunen, Enter, Taylor, Lund, Lance, Pittaway, Finlay, Kuss, Beveridge, Ellis. Probably also Sutton and Hodgson. The first 85 km of this stage was on fast reasonable quality tracks across the undulating plains to Wirrealpa Homestead on the edge of the Flinders Ranges. Fairly high speeds were only interrupted by a few gates and some dicey crests. Then it entered the twisty Angorichina Gorge through to just south of Blinman. This is a fabulous piece of road that would not be out of place in a WRC event. The fast speeds achievable on the first two thirds of the stage favoured those cars with high top speeds and the leaders were all clean. Perkins got it all wrong in the gorge and rolled the VW out of the event, leaving the car perched on its roof in the middle of the road! Several crews, including Stewart, wrong slotted at a dubious "straight on" instruction while Rowney stopped for a problem dropping 24 minutes and several places outright and on the road. Fury was perhaps slowed by dust behind Mason and/or Nalder. Hilton hit a tree and dropped 14 minutes. Again, about 90 cars completed the stage, but the times once again stretched out for the less experienced competitors despite the road conditions being pretty good and there being no exceptional hazards other than the dubious instruction. Both Tholstrup and Colless dropped more than one and a half hours, obviously striking problems. Cleworth had more gearbox problems in the Mini losing almost 2 hours. Colless would skip from Blinman to Nullarbor the next night whereas Cleworth eventually just headed for Perth. A few later crews would run out of late time and cut and run to Kingoonya or Nullarbor, either directly from Frome Downs or from the stage end at Blinman. The 2 hours and 15 minutes allowed for the listed 197 km looked reasonably tight because the first 30 km traversed the twisty Parachilna Gorge while the majority of the second part was on the somewhat rough main dirt road from Leigh Creek to Marree. Crews also needed to refuel before booking into control. The route chart ended at Parachilna, presumably because the organisers had re-routed the event and had not actually traversed the road up to Marree (they had originally intended the route to go via Camerons Corner, Innamincka and Birdsville, using the Birdsville track to Marree, but the area was far too wet to contemplate that route). However the stated distance was 18 km short so that the actual required average speed was 96 km/h. Many crews would have had their backup driver at the wheel and the main driver and navigator taking some well earned kip. But whoever was awake needed to twig to the fact that the distance was short, perhaps by observing the very clear signposts that said how far it was to Marree. Those who did not twig were surprised when they reached the specified distance but Marree was nowhere in sight! Some stopped, as if in disbelief. The Brock car was the first to succumb to the trap, with Richards perhaps asleep and they ended up dropping 9 minutes and were presumably passed by Portman and Ferguson who both cleaned, Bond who dropped one minute and perhaps also Carr, who also only dropped one. Perhaps the time lost fired up Brock as he almost lost the event on the next trial stage. Behind them Johnson and Mehta both cleaned and would have been next on the road. In the next group the Nalder Celica, with Richards the only one awake (and driving) picked the error and made it on time, passing Cowan who lost 7 minutes, and slotting in behind the Mehta Commodore on the road. Behind them, Stewart and Herrmann were the only others in the lead group to clean with Fury (probably with Bonhomme driving) dropping 1 minute, Dunkerton (with Mackay driving) 17 minutes, Warmbold 2 minutes, Mason 24 minutes, Jensen 18, Barth 6, Loader 20, Davis 17, Hurrey 12, Watson 17, Maloney 12, Quill 18, Jackson 14 and Mizel 9. What was meant to be a transport section had scrambled the road order and the outright placings! For some, the opportunity to meet their service crews at Parachilna was a blessing and any extra time lost on the way up to Marree was incidental. Hilton needed repairs to the Celica after his encounter with the tree and lost 45 minutes on the stage. Goldsborough lost 43 minutes and then decided to cut to Nullarbor. As many as twenty crews turned left at Parachilna and cut to either Kingoonya or Nullarbor, which was a shame, because the section to Coober Pedy turned out to not be too bad. Faulkner lost 53 minutes and McCubbin an hour and a half. Carter lost a lot of time fixing the Falcon's clutch and then had to 'race' to Perth where they were excluded as being out of late time. They continued from Perth under protest. The 5 hours and 20 minutes allowed for the run across to Coober Pedy was a ridiculously slow 80 km/h and one can only wonder what the organisers were thinking. Admittedly this was a replacement stage, the original route having been intended to traverse some very challenging terrain directly across to the Stuart Highway near Mount Eba. Perhaps when they surveyed it the conditions had been much worse. The first 250 kilometres up the Oodnadatta Track to William Creek was mostly super-fast and in reasonable condition despite a few dips and yumps, including five crossings of the now defunct Ghan railway line. It utilised a long (approx. 50 km) diversion to the south, presumably to avoid floodwaters at the south end of Lake Eyre (or was this part of the original route? ), and another shorter diversion from the main track around Warriner Creek. The 173 km run across the bottom of Lake Cadibarrawirracanna to Coober Pedy was a different matter and was covered in many places with sheets of water from unseasonal rains, requiring crews to take to numerous slow, twisty and sandy diversion tracks. The track in between was, however, fast, sandy and undulating so crews often arrived at these murky water hazards at high speed in the darkness, only really lit by the full moon. It was on this stage that Brock had a big moment, putting the Commodore on its nose for a distance but miraculously not barrel rolling (see Richards' account of the incident here, or your can read Tuckey's perhaps exaggerated account in An old dog for a hard road). Wayne Bell also burried the 17 Commodore in one of the lakes on the Coober Pedy road but radioed one of the other team cars to pull them out. Brock would have been behind them after their Marree lateness (although Tuckey suggests they were in front and were instructed by Shepheard to go back). Despite the dramas, everyone was early, but were pleased to see the sun rising as they finally headed into Coober Pedy for some fuel. As an indication of how early crews were, some actually booked in early to gain late time, such as Tholstrup who was 55 minutes early and Giddings 1 hour and 16 minutes early. Only a handful of cars were late, but Rowney must have had a continuing drama as he lost 2 minutes. About 70 cars completed the stage. We drove the stage to Frome Downs and so got into the driver’s seat from Broken Hill. We started the competitive at 7.01 pm. Although the first 54 km was fast gravel the dips and creeks were quite harsh and I had no chance to sleep in the back! We could see a car close behind at a gate at about 62 km so waited 30 seconds to let them through – it was the Mason Commodore (Car 88). When we turned south at 70 km towards Kantappa Station I could see a long line of headlights coming along the track from the east, but distance can be deceptive at night as we never saw any of those cars again and only one of them (Fury) arrived at the end of stage before we departed. Mason was stopped after Kantappa, perhaps a puncture, so we once again had a fairly dust free run. It was tight in places around Mulga Valley but once past Mulyungarie it was smooth sailing and I got some sleep. We were about 109 minutes early and only Mason and Fury arrived while we were waiting. Cowan and Stewart were still 4 and 2 minutes ahead of us respectively. I drove the stage across to Blinman, which was really good fun. The first part was super fast and our car just didn’t have the top speed to match it with the Commodores and Cortinas. At about 40 km there was a slightly dodgy instruction (S.O. perhaps should have been a K.L.) but we picked it whereas Stewart didn’t so we slotted in front of him. We had dust then so we think Cowan had wrong slotted as well but he pulled away. I was pushing hard with Stewart behind and went off the road on a slight brow at about 77 km. Fortunately there was nothing to hit because I was a good 50 metres off the road! Stewart stayed behind. At the Wirrealpa turnoff we passed Rowney stopped, probably a puncture. The run through Angorichina Gorge was superb and much more suited to our car. Somewhere along here we came across the Perkins VW upside-down more or less in the middle of the road. They were OK so we didn’t dawdle, dropping 5 on the stage. I continued to drive up to Marree, feeling pretty fresh, especially after we stopped at one of the creek crossings in Parachilna Gorge for a quick wash. Hiltons service crew were at Parachilna but we only stopped for a few minutes as the transport looked a bit tight and we needed to refuel at Marree. Stewart and the Warmbold Audi went passed but we passed the Audi soon after, but I sat behind Stewart in light dust. Wes and Geoff were soon both asleep. At the Leigh Creek turnoff I checked the distance on the signpost to Marree – I had been on this road only a few months earlier and I knew the conditions and that the distance would be correct - clearly there was something wrong with the route instructions because a quick calculation showed that I needed to average about 120 km/h and we still needed to allow a few minutes to refuel. So I started to push along at about 150 km/h, which was a bit interesting as the road had been wet and while the defined tracks were OK, if you drifted off them the rest of the road surface was quite rough and rutted. At one stage I needed to pass a truck which meant going out into the rutted part of the road. Fortunately Stewart was also pushing along OK but within about 20 km of Marree we passed him because he had an extra 2 minutes! Then we came upon Cowan who was virtually stopped, about where Marree should have been according to the route instructions. He was obviously going to lose time because he was meant to be 4 minutes ahead of us. We reached BP Marree with 5 minutes to spare and quickly refuelled. Mehta was just finishing refuelling and we booked into control straight after them, now tenth on the road. Wes drove up the Oodnadatta Track to William Creek while I actually got some sleep. I took over at William Creek for the somewhat entertaining run across to Coober Pedy. We knew we were well ahead of schedule but did not know what hazards might present themselves. While the sand based track was good, the expanses of water where tricky to see - it was certainly eerie with an almost full moon. I had driven the Birdsville Track at night some months beforehand and the conditions were similar and I quickly fell into a rhythm of judging whether there was standing water over a brow and, if so, looking for the detour track around it. I misjudged a couple of bogholes, skirting through the edge and covering the car with mud. It soon became apparent that there was no reason to push too hard as we were all going to be massively early, and indeed all those ahead of us were at the control when we arrived. No-one caught us and we passed no-one so we remained tenth on the road with Mehta ahead of us and Cowan now behind us.